I seriously had the best time at the Mika concert on Monday night. I’m still recovering from the excitement of it all. I’ve had a huge crush on Mika for months and have been waiting for him to come back to L.A. since I missed him at his previous performance at the Avalon in Hollywood and also at Coachella. Thanks also to my friend LS who went with me. Because I would not have gone by myself and Yoshi refused to go with me as soon as I got the idea in my head. But thanks to the Yosh for driving us, that was way appreciated! 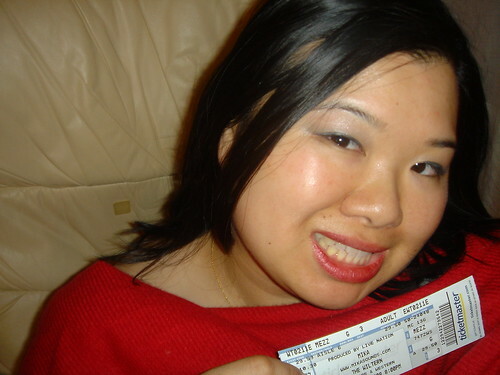 Since I don’t have any good pictures of Mika (or better yet a picture of me + Mika), here is a picture of me after I got home, holding the ticket (for an actual seat!) at the Mika concert. If you’re curious about what you missed, I share with you two videos from the concert in L.A. at the Wiltern. This is the first one. It’s 10 minutes long and it’s Mika’s performance of his Grammy-nominated song, “Love Today.” I love how he rips his shirt off for the last 3 minutes of the song. Yum! Both those videos were taken by someone on the floor. That’s right, if we hadn’t taken the old people seats up in the mezzanine, we’d have been down there on the floor in that chaos. I am definitely too old for that mess! I’m happy you had a good time, you deserve it. Happy Valentine’s Day!